Professor Kevin Ahlgren, right, takes gravity measurements. 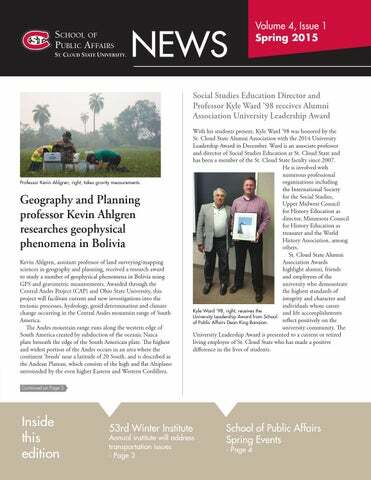 Geography and Planning professor Kevin Ahlgren researches geophysical phenomena in Bolivia Kevin Ahlgren, assistant professor of land surveying/mapping sciences in geography and planning, received a research award to study a number of geophysical phenomena in Bolivia using GPS and gravimetric measurements. Awarded through the Central Andes Project (CAP) and Ohio State University, this project will facilitate current and new investigations into the tectonic processes, hydrology, geoid determination and climate change occurring in the Central Andes mountain range of South America. The Andes mountain range runs along the western edge of South America created by subduction of the oceanic Nazca plate beneath the edge of the South American plate. The highest and widest portion of the Andes occurs in an area where the continent ‘bends’ near a latitude of 20 South, and is described as the Andean Plateau, which consists of the high and flat Altiplano surrounded by the even higher Eastern and Western Cordillera. With his students present, Kyle Ward ’98 was honored by the St. Cloud State Alumni Association with the 2014 University Leadership Award in December. Ward is an associate professor and director of Social Studies Education at St. 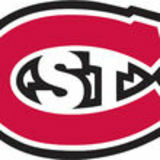 Cloud State and has been a member of the St. Cloud State faculty since 2007. He is involved with numerous professional organizations including the International Society for the Social Studies, Upper Midwest Council for History Education as director, Minnesota Council for History Education as treasurer and the World History Association, among others. St. Cloud State Alumni Association Awards highlight alumni, friends and employees of the university who demonstrate the highest standards of integrity and character and individuals whose career Kyle Ward ‘98, right, receives the and life accomplishments University Leadership Award from School reflect positively on the of Public Affairs Dean King Banaian. university community. The University Leadership Award is presented to a current or retired living employee of St. Cloud State who has made a positive difference in the lives of students.